Veterans Day is a celebration of the men and women who have heroically served our country and defended the democratic values we cherish. This time honored tradition pays tribute to the scores of American veterans for their patriotism, love of country, and willingness to serve and sacrifice for the common good. Veterans Day is a celebration of the men and women who have heroically served our country and defended the democratic values we cherish. This time honored tradition pays tribute to the scores of American veterans for their patriotism, love of country, and willingness to serve and sacrifice for the common good. Over the course of our history, the world has certainly changed and our armed forces have changed with it, but the valor, dignity, and courage of the men and women in uniform has remained the same. Veterans Day not only honors the members of United States Armed Services, it encapsulates the very ideal. This week, I led the City of Los Angeles Salute to Veterans and honored the outstanding service of Angelenos who not only served our country in uniform but continue to be pillars of strength and service in their communities today. 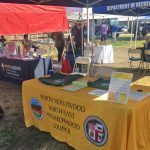 I’m happy to announce United States Army veteran and North Hollywood North East Neighborhood Council president Ernie Moscoso was Council District 2’s Veteran of the Year. Councilmember Krekorian with Council District 2 Veteran of the Year Ernie Moscoso. A former Army officer, Ernie served during the Vietnam War from 1969 to 1973. As the Commission Officer 2nd Lieutenant in the U.S. Army Field Artillery, Ernie trained incoming service members as the Firing Range and Basic Rifle Marksmanship Instructor Officer in Charge. Soon after, he was tasked with notifying the families of the brave soldiers whose lives were lost in the war, in particular, the individuals who were identified as Prisoners of War or Missing in Action as the Executive Officer, Honor Guard Officer in Charge and the Notification and POW/MIA Survivor Assistance Officer during his service at Fort MacArthur in San Pedro. As the difficult war came to an end, Ernie was honorable discharged for his service in 1973. 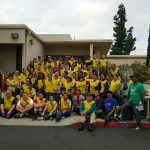 Over the years, I’ve gotten to know Ernie closely and have seen great work he’s accomplished as the president of the North Hollywood North East Neighborhood Council. Whether it’s cleanups, traffic issues, opening a new playground or improving our parks or infrastructure, our partnership has helped make our community a better place to live. 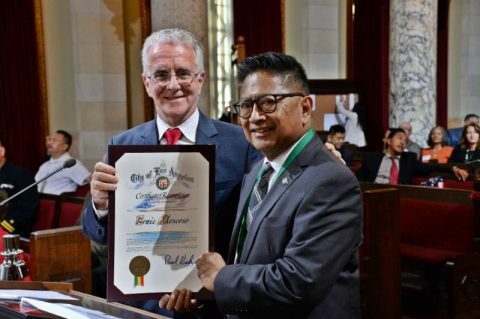 I proudly thank Ernie Moscoso for his profound service to our country and for his unwavering dedication to North Hollywood. On this Veterans Day, my message to all of our veterans is simple: thank you. Through your service you remind us of the extraordinary potential of ordinary Americans. I’m incredibly grateful for all the heroes we honored in celebration of Veterans Day.